Well, that’s taken the shine off things a bit! It looks like my Kerv Ring has died after less than 18 months! This post on my Kerv ring has attracted a few comments, some of them not so great! The most worrying ones are the ones from the original KickStarter backers, it seems that a fair number have not received their rings and have great difficulties getting acceptable responses to their inquiries. Read the comments and you’ll have to decide for yourself if this business should receive your money – I’ve already paid and it would be cutting my nose off to spite my face to stop using it! 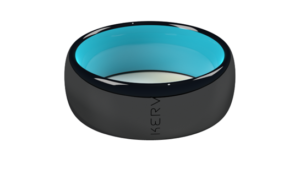 A while ago I bought a kerv ring, which is a ring you wear that lets you (usually) make a contactless payment without needing to pull out any cards/phones/watches. I thought I’d post some of my experience with it. To see what it looks like visit the site, it’s glossy! The ring costs £100 which is a fair bit, though it does occasionally go on sale for £80. Its worth noting that that cost is not strictly a one-off – it’s going to expire in 4 years according to the FAQ. I think of it as £25 a year / £2 a month, which doesn’t hurt as much. Frankly this wasn’t a great experience, I ordered mine at the end of June and it took nearly a month to arrive, which to be fair was pretty much as long as they said it would take. It would have been nice if they’d said 4 weeks and then delivered in 2 weeks. After 3 weeks I did change my “colour” choice to speed things up a bit too. I have to say, the kerv team were very responsive to my emails, getting back to me within a day. When it works, and it does work a lot of the time, it’s great. Occasionally I have to do the “fist bump” twice, and sadly not quite *every* payment terminal accepts it. There’s a terminal in my local Maplin’s that doesn’t like it, so you won’t leaving your wallet at home – not that every shop accepts contactless anyway. It is a pre-pay system, so you have to make sure you top-up regularly, or you can enable the auto-topup system. Which believe me after you’ve suffered the embarassment of declined payments you’ll seriously think about. Oh, and you get a “virtual card” if you need yet another card! Easy to use and keep topped up. It’s tough, I’m hard on things I wear, very hard. And it’s not showing signs of scratching. It’s comfortable, it’s not “square”, it has a rounded inner profile that works very well. It doesn’t always work first time, and for specific terminals, not at all. Probably not the ring’s fault. The Statements only show when and how much you spent. The ring sizes probably don’t go low enough – only as low as a UK M. I bought a size N for my little finger (I have small hands), and that is loose on all of my girlfriends fingers. I like my ring, it’s convenient and has a certain cool factor. I feel a little smug every time I see someone fiddling with their phone to pay for something. Would I buy another one in 4 years, yes I would! Could I live without it? Yes, it’s not a critical part of my life, I usually have a wallet on me. Just in case you’ve not the slightest bit of interest in Star-Wars The Old Republic held a mass beta weekend this weekend. This is where Bioware stress test their servers and try to make us all feel a little less anxious about just how far away the game is. Of course I played, patient not quite as long as I’d like, other Real Life commitments meaning that Saturday was not a play day, but I did play to level 10 (just). And without seeming too grumpy, WoW is the game I would compare it to. 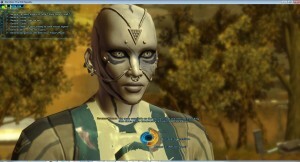 More so than Mass Effect 2. 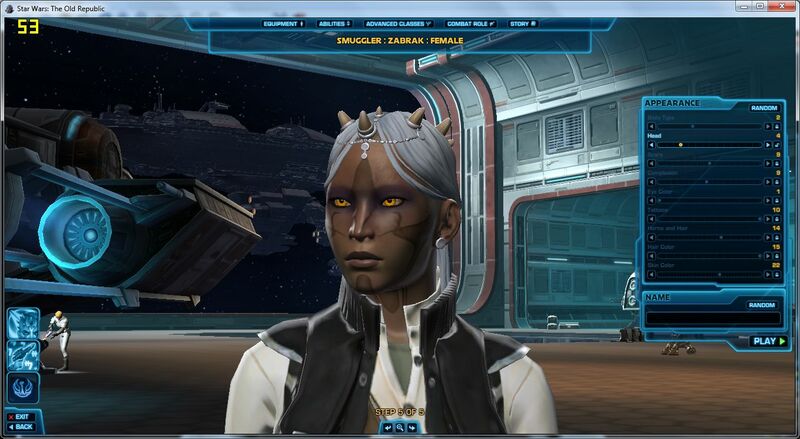 So, first off I present Fflowers the Bounty Hunter, I was worried initially that the characters would be very samey… but this isn’t too bad, soon to disappear into the bitbucket.. ah well. How did I find the game 1 month before release? Well, I had 1 main complaint.. there are no subtitles except for the “foreign” language sentients and (usually though not absolutely always) the very last thing said. If you disable sound there are interactions where you see lips flapping for minutes and are then presented with a choice like “Yes, I’ll do it”, “You can stuff it”, and “what do you think Meko?” And I’m pretty sure I saw at least one without any subtitles showing at all! 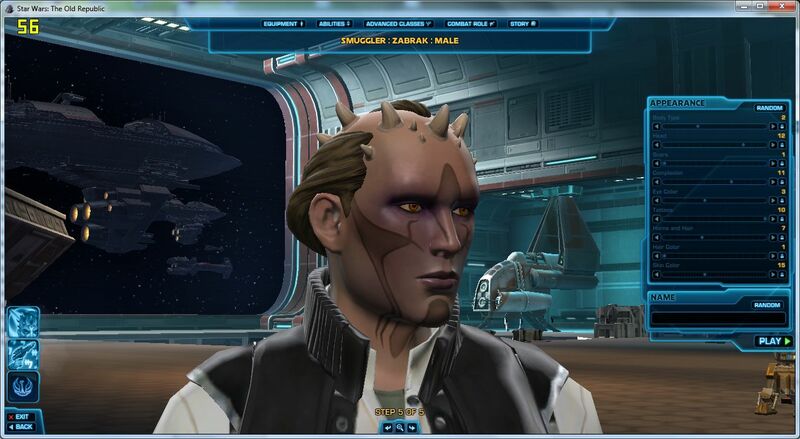 Here for my own personal reference are a couple of screenies of the settings I’m likely to use for my smuggler. When it gets rolled.. can’t be sure whether I’m rolling mel or fem yet. I’m fairly happy with the look of these, I’ve found that although I can create characters I don’t like the look of, I can usually get along with most, in fact it tends to be the more “perfect-human” ones that creep me out worst! Also this weekend I downloaded the GameString adrenaline game client. Now *that* really is a beta. But for your edificati0n I do haev a photo of it “in action” as it were, playing on a couple of devices .. A small netbook, an Android phone, and the main laptop. Not perfect by any means, the aspect ratio is wrong and I think the sound is missing though I didn’t have it turned on. Also the mouse control is more than a little difficult. 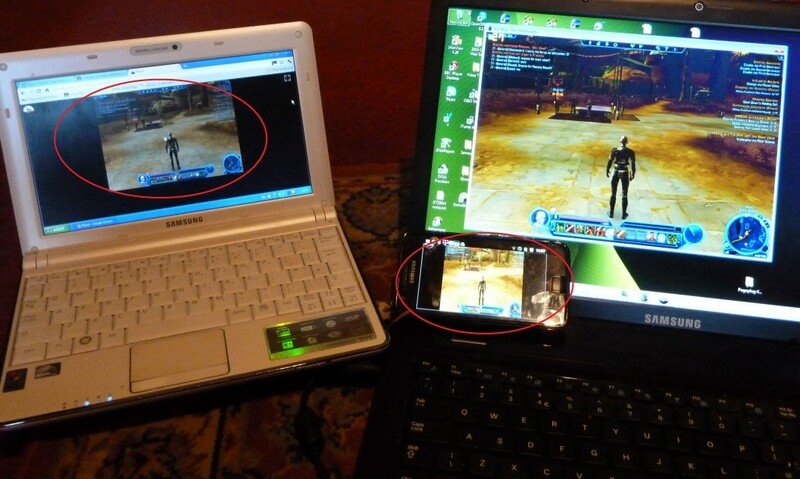 Yes you *can* drive them main laptop from the remote device! Lag is about half a second.. so clearly work needs doing! 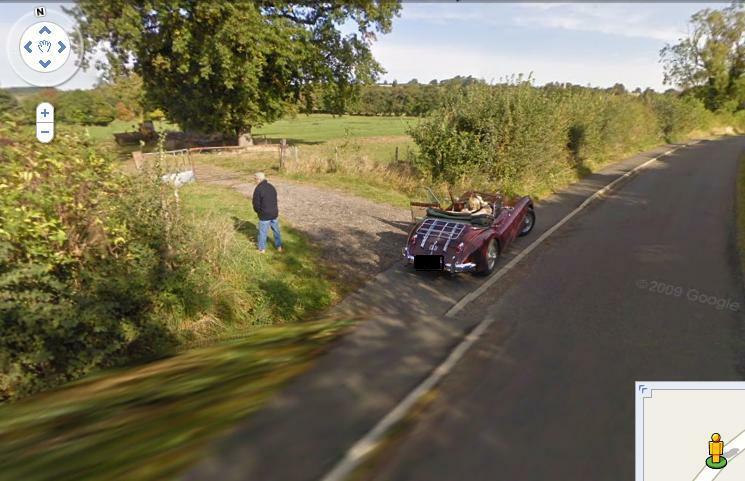 What you find on Google streetview! You could read the number-plate too! was created on your behalf. You will be asked to change your password when you login for the first time. Oh yeah! A 32 character password! Are they trying to tell me something about security? P.S. A password so complicated you have to write it down is worse than using your cat’s maiden name. I went last night to see Judie Tzuke (wikipedia link) at the Sheffied City Hall. It was brill, sale a few problems finding the place – not that find -1.472238&spn=0.001366, approved 0.002529&t=h&z=19″ target=”_blank”>Sheffield City Hall is hard to find, a stonking great building in the center of Sheffield with a big sign on the front saying Box office (where you go to pick up the tickets). Except it wasn’t open! Eventually we found where the gig was – you had to go around the back! No signs, no posters saying playing tonight, no nothing. The venue is quite intimate, we were at the back of the balcony which when we bought the tickets I thought wasn’t going to be very good, but the place is so small there’s no problem. The gig was pretty damn good! The obligatory support acts, two of them, one of whom was Judie’s daughter Bailey and the the lady we’d all come to see. For those who don’t know Judie Tzuke was big way back in the 80’s, not that that mattered. She gave us a selection from her extensive repertoire and though there were a couple of mistakes – it was only the second date of her tour – it was incredible just how true and powerful her voice still is. The set started with some tunes I didn’t know, but it ended with some of her older and, as she admitted, livelier material. This is where the set really came to life for me. Sportscar was just plain incredible, outstanding. Here we go again, performed near acapello with just a piano for acompaniement and her two daughters filling in for the original multi track was chilling. I only have two complaints, she left us wanting more, much more, despite ending at 11pm. And I think the whole thing would have been better standing rather than sitting. I would have loved to dance (well at least shuffle around incompetently). I’ve listened today to the original studio tracks, and while comparable, the live set was so much, well, more, just more! Live gigs bring something that just can’t seem to be captured on disk. Next time she tours, which isn’t often, I’ll be pissed if I miss it. A very very few of you might possibly have seen that I “like” pogoplug on facebook. Which isn’t strictly true, cialis 40mg it’s just what you get for pressing buttons at random. I do have a pogoplug but I’ve not had it quite long enough to say that I “like” it yet. That said, patient it seems to do what it said it would. So that’s definitely a plus point. Another plus point is that you can install extra software – if you’re fairly tech-savvy and prepared to faff around trying to find out how. Method A: do some faffing and then just install stuff. Your little pink pogoplug works as before with extra bells on it. Method B: do some faffing around and then jsut install stuff. Except your pogoplug is now no-longer really a pogoplug, it’s another linux box. You lose the my.pogoplug function! Guess which one the “community” has opted for? Now guess which one I went for? Yup, I bought a pogoplug, and I kinda want it to keep all the original functionality, apparently unlike the real men out there. Anyhow, so I’ve got this thing and I’ve installed a webserver, all it displays is “hi”, but from little acorns….. Except, I have a webserver already thank you very much – you’re looking at it. So what do I do with all the groovy programs I can install on the little 4-watt box? I’m reading Pride and Prejudice at the moment, about it I’m at the section where Lizzy is about to visit Pemberly and Ms Austin is describing the countryside. It has reminded me of the awe I am always given when I too visit some of the old estates. Not the buildings, though they are inspiring, but the landscaping. It amazes what the likes of Mr Capability Brown were able to do with vast sums of money and time. Mind you it’s not just the application of money. In my humble and humongously ignorant opinion what these landscape architects did was done in two parts. First off they re-arranged the landscape, moving drives, paths, adding ponds and lakes, even moving rivers if they felt like it. The end result is a view that is generally pleasing and in effect making the landscape match a pre-concieved mental, or possibly, physical image. Very impressive and all achieved in a relatively short time. But for me this dwarfs in comprehension to what they did with the trees. After the landscape is arranged they decide where to plant trees, and what species should be grown. It doesn’t sound very impressive, a bit like arranging your flowerbed. But for me the impressive bit is that the outcome of this kind of work is long-term. It’s unlikely that any of the patrons that commisioned these works lived to see the grandeur of their plans come to realization. I’ve been to parks where the form, shape and arrangement of hundred year old trees is so much an intergral part of the scene that it’s hard to imagine how it looked when these were all just saplings. It takes not just incredible sums of money but also an almost arrogant confidence in your family’s continued possesion of the property to commision this work. It gives me a strange conflict of feelings, on the one hand I can see and almost phyically feel the natural/artifical beauty resonating with my (for want of a better word) soul. On the other hand I can’t forget it was all created by degrees of social inequality on a scale almost too large to notice. Country parks… I love country parks, I hardly ever visit them. I love them because they give the opportunity for townsfolk of almost all capabilites to experience something of the country. I also love them because they act as magnets for the majority of townies that want to “get away” to the country, and (here’s the massively selfish bit) it keeps them out of the real country! There! I’ve said it! I’m not proud, just selfish. I mean, we (my closest family) have a saying about people “picnicing in the car-park”. Haven’t you ever noticed that the farther away from the car-park you get the fewer people there are? I mean, fifteen minutes walk and you’re damn near on your own! Let them have their BBQ’s in the car-park and give me leave to go for a 2 hour walk.